The Omron TM is designed to free workers from repetitive tasks and boost the quality, efficiency, and flexibility of your operations. Built to work with humans and machines alike, this collaborative robot will allow for seamless manufacturing and quick changes to your product production lines. 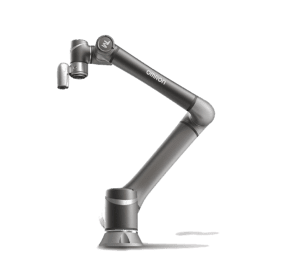 With built-in vision and a user-friendly, plug-and-play user interface, the Collaborative Robot makes it easy to automate the most tedious steps on the production line. It's intuitive programming capabilities reduces installation and setup times compared to other traditional robots. Built for the future of automation & designed for modern manufacturing. This collaborative robot is Industry 4.0 ready. Download all the collaborative robot specifications here! 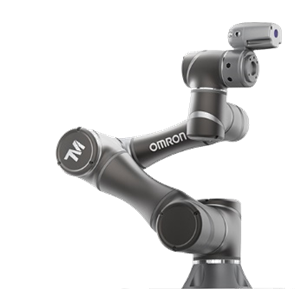 We believe Omron TM series cobots are second to none and offer some key advantages such as integrated vision, remote camera support, heavier payloads and longer reaches than some of the other brands. We also know that a successful installation means selecting the proper end-of-arm tooling. Whether using mechanical or vacuum grippers, or a completely unique and custom gripping system, AOP has the technical capabilities and years of experience with electronic and pneumatic components, to help you develop a solution that will work best for you. Cobots are designed to work side by side with a human. That said, the Omron TM may be the appropriate robot for an application that does pose a risk to humans and thus requires safety guarding of some type. If that is the case, AOP has both mechanical guarding and electronic safety equipment to help you address even the most stringent requirements.